Carson Wentz attempts to the run down the field and hand the ball to his receiver, which is the more efficient way for him to trust that they'll hold onto it. As we know, power rankings are kind of pointless, but we click them anyway. Here's a roundup of where the Eagles "rank" after they were beaten down by the Green Bay Packers Monday night. Rookie QB Carson Wentz has certainly been hurt by the lack of weapons in the passing game. Eagles wide receivers rank 28th in yards this season and 30th in yards per reception. The Eagles play the Bengals and their A.J. Green-less wide receiver group this week. #JimmyNote: And they negate big plays to the tight ends and running backs with stupidity. Why has $103 million man Fletcher Cox been invisible this season? Ugly game on all fronts for the Eagles, from defensive breakdowns to some mysterious officiating and a couple of important misfires by Carson Wentz. Thought the most important development was when the officiating crew missed an obvious hold on Vinny Curry on a third-down conversion to James Starks. Green Bay went on to score a touchdown to go up 24-13 on that drive. Of course, when you allow opponents to go 10 for 14 on third down, you aren't going to win very many games. As for Wentz, there is no glossing over his declining play after his shiny first four starts. He is missing key throws. Although his supporting cast outside gives him anything but support. #JimmyNote: Honestly, I don't see much declining play. I see a rookie quarterback who knows that he has to make all the plays for this team in order for them to be successful, and he not only isn't getting help, his players around him are actively destroying the big plays they are able to make. Carson Wentz posted just 13 points against a wounded Packers pass defense. December could get even uglier for Philadelphia's offense. #JimmyNote: Because Carson Wentz is out there on the field by himself? Carson Wentz has showed flashes of why he was the No. 2 overall pick, but he’s also looked like a rookie more often than not. He has just four touchdown passes in his last seven games, throwing seven picks in that span. 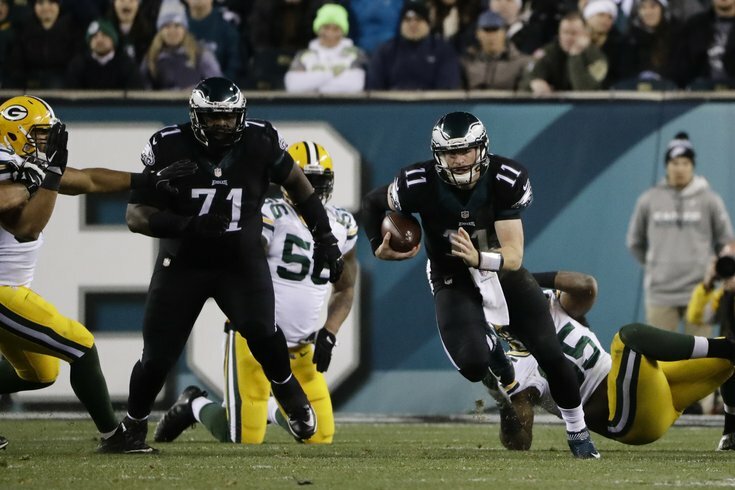 The Eagles are limping to the finish line, and their playoff hopes are all but dashed. They’re 2-6 since that hot start to the season. Memories of how good they looked in that start (and some solid wins against the Vikings and Falcons since) probably kept them too high in the rankings, until now. They've lost two straight games and any talk of winning the division is done. The wild-card chances are slipping away as well. #JimmyNote: Their chances for the division were gone weeks ago, lol.